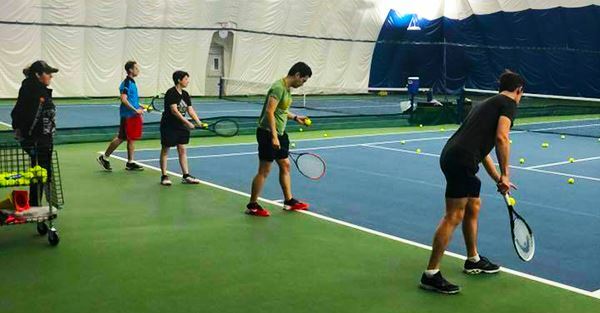 Sign up quickly for two hours of group instruction and play led by a pro. beverage at local bar and restaurant. PLEASE NOTE: In case of a sold-out event, priority will be given to those who are 1 (beginner) 1.5 (intermediate beginner) 2.0 (advanced beginner) and 2.5 (intermediate). We welcome 3.0 as well (advanced intermediate). 450 W. 43rd St., between 9th & 10th Aves. (212-594-0554). Directions via train: A,C,E to 42nd St.& 8th Ave. Exit on the west side of 8th Ave. Walk west along 43rd St. The entrance is on the south side of 43rd St., between a florist and the Food Emporium. Ring the buzzer, wait for a response, and proceed up the steps to the next door, where you will automatically be buzzed through. Go up one flight to the entry. Meeting: We will gather in the lobby/lounge. Please arrive by 7:45 pm to allow yourself time to change in the locker rooms. After we are finished playing at 10, you are welcome to join us for a social get together at a nearby restaurant. Its a fun way to get to know each other better. Food/Beverage: No food or drink will be provided by MTG for this event. Feel free to bring your own drinks, but please be careful on the courts. There are usually water coolers positioned at each court with disposable cups. Lockers: There are full locker room facilities available with showers but with limited availability to lockers. If you want to use a locker, please remember to bring a lock. Please note the lockers are for members of the club, so there might not be a locker available on the day of our event, but generally there are lockers available for use. Cancellations: There is a 48-hour cancellation policy for this event. We are unable to provide any refunds with less than 48 hours prior cancellation notice, nor can we apply the cost to a future event. Payment is non transferable. As a courtesy, we would appreciate notification of cancellation so we may adjust court assignments if necessary. Hope to see you for some fun, instructional tennis, and socializing!